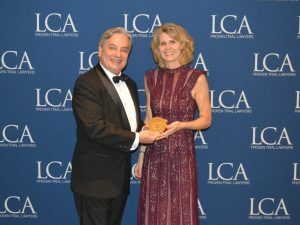 Hoover Hull Turner LLP is pleased to announce that Litigation Counsel of America (LCA) presented firm partner Alice Morical with its prestigious Peter Perlman Service Award at its 2018 Fall Conference & Celebration of Fellows held at Gurney’s Newport Resort & Marina in Newport, Rhode Island, on October 24-26, 2018. The Peter Perlman Service Award recognizes LCA Fellows who contribute in meaningful ways to society by giving back their time and resources in an effort to improve the lives of others. Alice focuses her community service in three areas: with the federal courts in Indiana, the Indianapolis legal community, and the broader central Indiana community. Alice regularly volunteers for federal court pro bono programs, including those that offer counsel to inmates seeking to protect their constitutional rights. She also serves on the Board of the Indiana Community Defenders Program, which oversees federal public defenders in Indiana. Alice has also been a long time, active participant in the Indianapolis bar. She just finished her term on the Indianapolis Bar Foundation Board of Directors, where she was both counsel to the Board and head of the Impact Fund Grant Committee. She serves on the steering committee of the recently formed Indiana Women’s Empowerment Network, an organization focused on advancing women in the legal profession. The incoming president of the Indianapolis Bar Association asked her to serve as the counsel for the Indianapolis Bar Association Board of Directors in 2019. Alice also supports the central Indiana non-profit community. She served as Chair of the Board of School on Wheels, a non-profit focused on providing educational support to homeless children. She is now on the Executive Committee of Rev, the premier social event at the Indianapolis Motor Speedway leading up to the Indianapolis 500, which supports the Indiana University Health Foundation.